You Are Here: Home » Hair Treatment » What Causes Hair Loss in Teenage Males? Have you started to notice hair loss at a very young age? Has it gone from being absolutely thick to being very thin, and sparse? Hair loss is something that happens to the majority of men at some point in time. We’re in the state of denial, clinging to the idea that hair loss won’t happen to us. Unfortunately, this dissent makes it all the more difficult to stop male pattern baldness in teenage males. We refuse to accept the signs of thinning hair and live in a constant state of delusion until that critical moment that we look at ourselves in the mirror and notice that half our hair is gone! 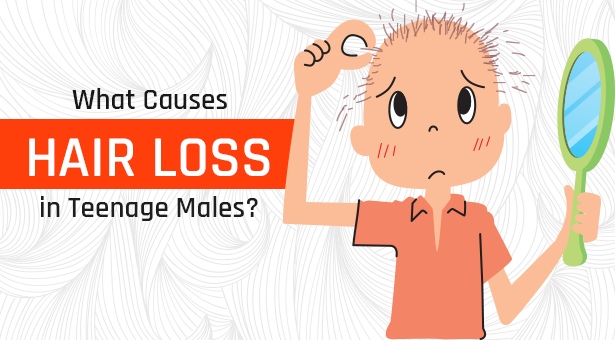 Must Read: Hair Loss In Male: Why You Are Losing Your Hair? Sometimes boys as young as 15 begin to notice the signs, like thinning hair or the development of a widow’s peak. But so long as they understand the causes of hair loss, there are ways for young men to maintain their hairlines. Do You Want to Know Why Hair Loss Affects an Average Guy in his Early 20’s? A maturing hairline is quite normal for men in their teens and early 20s, but thinning at the temple areas and above the eyebrows can result in the appearance of a high forehead. This is generally when most young men start to worry about their receding hairlines. They may also begin to notice excess shedding when combing or showering, something that could have been missed by earlier, less image-conscious generations. There is some indication that hair loss is becoming more prevalent in younger men and there are a few possible reasons for this. There are multiple lifestyle and environmental factors that are thought to be contributing to an earlier onset of hair loss in teenage men, and stress is the leading cause. The years in between school and working life are packed with changes and sometimes the pressures of study, finding work, are enough indicators to push anyone’s stress levels over the edge. Stress is an often cited cause of temporary hair loss, and it can trigger genetic patterns of hair loss. Androgenetic Alopecia is a hereditary condition inherited from the mother can develop what is known as stress alopecia. In men, this condition is also known as male-pattern baldness. Hair is lost in a well-defined pattern, beginning above both temples. Androgenetic alopecia in men has been associated with several other medical conditions including coronary heart disease and enlargement of the prostate. Additionally, prostate cancer, disorders of insulin resistance (such as diabetes and obesity), and high blood pressure (hypertension) have been related to androgenetic alopecia. Dairy Makes You Less Hairy! There have been certain theories that suggest a connection between dairy products such as butter and cheese and an increase in eczema that causes hair loss. Although avoiding dairy products may help improve the condition of your skin, there is little evidence to confirm that this will stop you from losing hair. If your body has undergone surgery or a traumatic life occurrence, your hair growth cycle may be temporarily disrupted. However, once you begin to notice large amounts of hair shedding, you may not be able to recall the event responsible for it. Any hormonal conditions such as hypothyroidism can cause hair loss. Hair can fall out if there is an imbalance in the androgens and the thyroid gland is the gland responsible for hormone production. If there’s an issue and it’s either over or underactive it can result in hair loss. You may lose hair if you use chemicals such as hair dyes and the direct heat on hair follicles due to blow dry. What you eat or don’t eat may also be playing a role; teens that don’t take in enough nutrients to sustain their lifestyle – such as vegetarians who don’t eat enough protein or athletes who don’t get enough iron in their bodies – may begin to lose hair. Finally, a medication you take, such as an acne medicine or the bipolar disorder medication lithium, may be at fault. If this is the situation you’re in there’s nothing to worry about, our specialist doctor at Skin City can prescribe a medication to stabilize your thyroid, or if needed, a laser-targeted treatment to get things under control and get back to life. Most of the times hair loss is temporary, and it’s a cause of a temporary phenomenon. The good news is that there are a number of treatment plans available that can stop and, in some cases, even reverse hair loss with our high-tech hair transplant solutions. Concerned about hair loss or scalp condition? Call us on +91 9890225577 / +91 9422458130 for an appointment today!